The Crux Of The Global Warming Fraud: Global Warmingistas Claim CO2 Drives Temperature, But Just The Opposite Is True – How Can People Be So Stupid? By now, just about everyone has seen Al Gore’s PowerPoint presentation or his movie where he lectures about the wonders of the data contained in ice cores. After a brief explanation, he puts up a graph that shows the CO2 records from ice cores drilled at the Vostok research station in Antarctica that cover the last 650,000 years. Then, he proceeds to put another graph, below the first graph, that shows the air temperature when those ice core samples were formed. Then, in a smug, self-satisfied manner, he asks “Did they ever fit together?”, just like school children look at a globe and ask if South America and Africa ever “fit together”. Well, Al, yes, the pieces do fit together, but not in the way that you stated. You stated that there is a relationship between global temperature and atmospheric CO2. Well, that is correct, but not in the way that you claim. Watch this video and you will see what I mean. After you watch the video, then go on to my graphics and further discussion below. But, please watch the video first so you can grasp the full measure of the fraud that has been committed against the citizens of the world by the global warmingistas. Now that you have been reminded of the global warming propaganda, and heard some views from accomplished climate experts (although perhaps not recognized by the global warmingista climate Nazi’s associated with the IPCC cabal, of course), you can continue to read on. 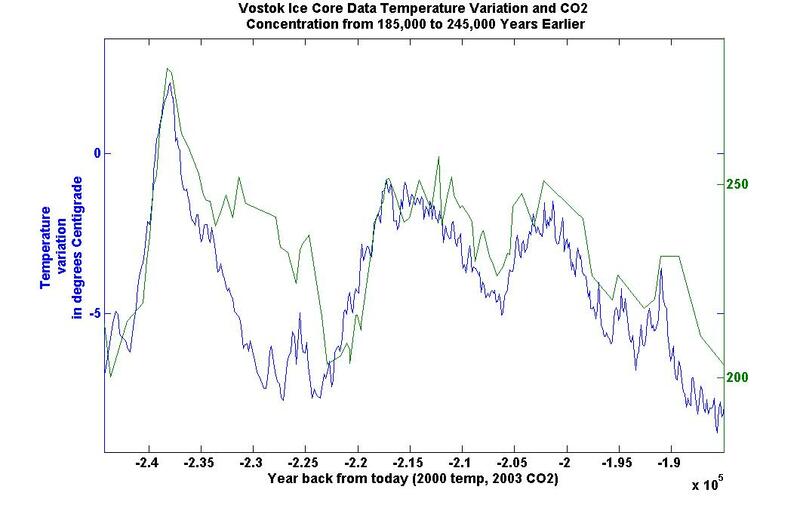 This is the Vostok ice core data going back about 400,000 years. On this chart, as on Al Gore’s chart (which are basically the same except that his chart goes back a little further), the current time is on the left side of the chart. This makes it a little hard to interpret, since most of us are used to seeing time go from left to right on a chart, with the left side representing the oldest data, but you can understand the chart just the same. On this chart, three things immediately stand out. 1) There is an ice age about every 100,000 to 150,000 years. We are due for one. Of course, since we don’t really understand what causes climate change, and we certainly don’t really understand what causes the ice ages, we cannot say for sure that one is imminent. But, just looking at the graph, I would say that we had better worry about a coming ice age rather than global warming. In fact, if the trend continues, maybe we need to figure out a way to warm the planet to temper the next ice age. 2) It has been warmer in the past at the peaks of the warm interglacial periods. So, if it does get warmer, it is definitely not unprecedented. Anyone who states that it has never been this warm is simply uninformed or lying. If they mean it has not been this warm in the last couple of hundred years, that may be correct. But, since we are coming out of the little ice age, you would expect warmer temperatures. 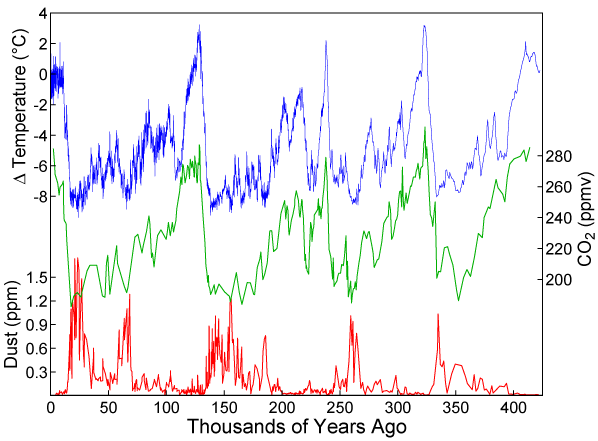 It has been warmer in the last few thousand years, and this is shown in the data. 3) The current interglacial warm period seems relatively flat, and cooler, than previous interglacial warm periods. So far, so good. If you look at this graph, you might conclude, as Al Gore would have you believe, “When there is more carbon dioxide, temps get warmer.” Right here, you can see a flaw in his argument if you go back to the video at about the 3:52 mark. You can clearly see that temperatures were significantly warmer in the last interglacial warm period compared to today’s temperatures, in spite of the fact that CO2, today, is higher. If Gore’s argument that CO2 controls the temperature is true, this fact, alone, should make you question his claim. But, now for the fun part. As I said, as a scientist I could never understand why Al Gore did not superimpose the graphs so you can get a better feeling for the relationship between CO2 and temperature. I suspected it might be because he was trying to hide something. So, I decided to download the Vostok ice core data and plot it out for myself. The data is freely available at the CDIAC site. Once I had the data, I loaded it into Matlab and plotted it out. This time, unlike the chart above, I plotted both temperature and CO2 on top of each other, and I reversed the time scale so that now time goes from oldest on the left to most recent on the right. The graph below is the result. To make this graph clear, the blue line is temperature, with the scale for that line on the left side. That temperature is “relative” to the normal Vostok temperature, whatever that is. It is in degrees Centigrade. The green line is CO2 concentration, in parts per million. The scale for CO2 concentration is on the right hand side of the chart. On this graph, the data goes back 410,000 years. The CO2 data starts at about 2000 years back(which would be the year 0 CE), while the temperature data starts in the year 2000 CE (which is shown as 0 on the graph). That is why this chart does not show CO2 going to the present 381 ppm, and the data stops before the right hand side of the graph. It only goes to about 280 ppm, which was the value at about 0 CE. (I did not take the time to find more recent data for the CO2 concentration, but we know it has gone up over the last 2000 or so years to about 381 parts per million. Obviously, that change has not made a significant change in recent temperature, since that seems to have “flat-lined” in the current interglacial period when compared to previous interglacial periods.) The temperature data extends to 0, or the year 2000 CE.) As I mentioned, I put the time scale on this graph from left to right, with left being the oldest data and the right hand of the chart being the most recent data (year 2000 CE). I did this to make the understanding of the graph more intuitive, since most of us are more familiar with time lines going from oldest to most recent as you go from left to right. To see the graph more clearly, click on it to enlarge it. If you look really closely, you can see that CO2 increases AFTER temperature increases; not the other way around, as Al Gore would have you believe. It is even more clear how temperature goes down before CO2 goes down. If CO2 was controlling temperature, clearly temperature would only go down AFTER CO2 went down. 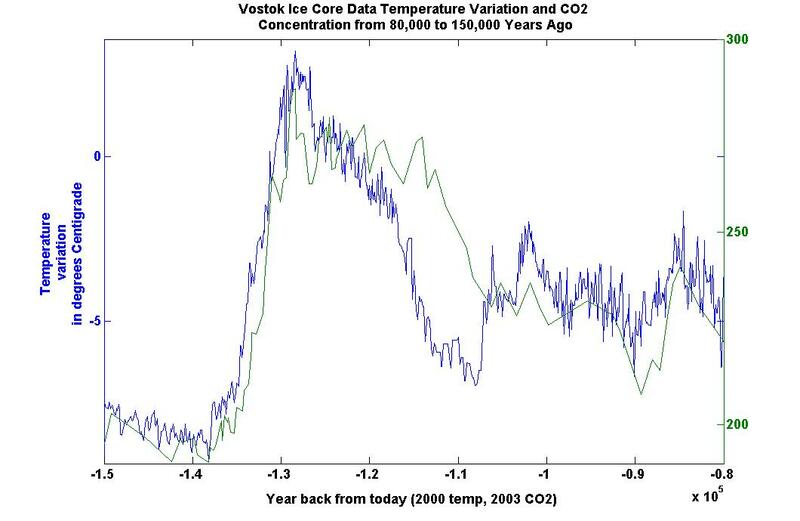 Remember, this is the same Vostok ice core data used by Al Gore; it is just presented more clearly. Also, it is very clear that temperatures have been higher in the past. And, that global cooling seems to be more common over history than global warming. Just looking at the graphs, I would be far more worried about global cooling, since it is far more destructive to life than warming. To make things even clearer, I show two more graphs. These graphs are created from the exact same data set. The only thing I have done is to “zoom in” on a smaller time scale, since the time scale on the first graph is so large that it is sometimes hard to tell which rises first, CO2 or temperature, although it is always clear that temperature drops well before CO2 drops. This fact, alone, clearly demonstrates that CO2 does not drive temperature. Also, because of the huge time scale involved, I would tend to trust the more recent data, both because there is more of it and it might be more accurate. The graph above shows the data from about 245,000 years ago, which corresponds to some of the discussion in the video clip, where they point out that the concentration of CO2 never drove the temperature. In the next graph, I show an even more recent period. Here, again, you can clearly see where temperature goes up, and then CO2 goes up. You can even see some very fine structure, where temperature drops, after which the rate at which the CO2 concentration is increasing slows down. This, again, shows that temperature drives CO2 levels in the atmosphere, not the other way around. The whole push to curb CO2 emissions is purely political. It is intended as a way to force global governance, enormous wealth transfers, and more governmental control over individuals. It has nothing to do with a concern for the climate, global temperatures, saving polar bears, or preventing an increase in sea levels. And, if you think I “adjusted the data”, as the global warmingistas have been caught doing many times in the past with their data, and as they even discuss in the recently released CRU e-mails and files, go ahead and download the data and plot it yourself. It is freely available at the CDIAC (Carbon Dioxide Information Analysis Center). You will get the same results. And, this is another example of why total scientific transparency is so important. If the raw, original data was not available at CDIAC, you would have no recourse but to believe what Al Gore and his minions have been telling you. Posted in: Al Gore, cap and tax, climate center hack, climate change, Climate scam, climategate, cop-15, global government, global warming, Global Warming BS, global warming scam, global warming swindle, global warmingistas, human stupidity, main stream media, Michael Mann, new world order, Obama, one world government, politics, science, Vostok ice core data, world events. The Al Gore movie has a clue in it that makes the CO2 (red graph on the left hand side) at about 2:46 going back in the timeline. This means that the CO2 in Al’s movie is not trailing the temperature. Even if he had both graph together it would not show in his graph the trailing CO2. 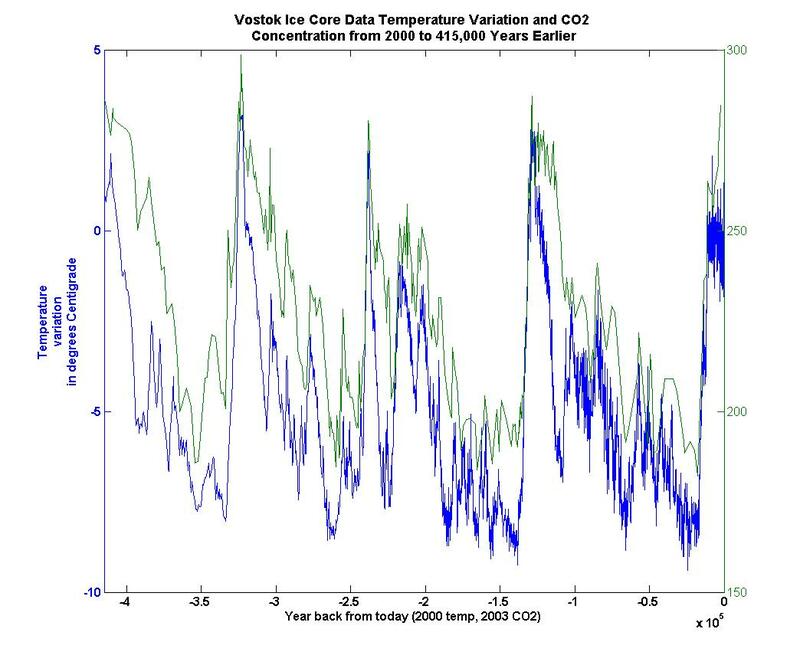 Looking at the Vostok data on the graphs above, one can clearly see that there are large variations over thousands of years, where CO2 and temperature don’t fit together. There are multiple instances where CO2 is rising while temperature is falling, and visa versa, and these oppositions are occurring at intervals of 500 years to 2000 years or greater. But looking over these huge 100,000 year intervals, one can see the correlation. The correlation happens on the huge time scales (10,000 years or more), and not on small time scales (500 or years or less). Can everyone see that on the graphs above? When the scientists, on the “Al Gore Debates Global Warming” video above, point out that CO2 was rising from 1940 to present, while temperature was falling from approximately 1940 to 1970, they are pointing out a fact that is consistent with the normal variation in the CO2/Temperature relationship, based on the Vostok graphs above. Not one person who has seen the graph above, could say that CO2 and temperature go tightly hand in hand on the scale of 1 year intervals, or even 10, 20 or 30 year intervals. They don’t. So when the scientists on the video use that particular example as an argument that CO2 doesn’t play a role in warming the planet, such is a logical fallacy. Their argument is illogical. Their argument is flawed. A logical person, that knows nothing more about the climate than whats on your graph above, can see that. None of the statements the scientists on the video make logically disprove that CO2 plays a role in warming the planet. The video is meaningless, other than it provides some entertainment value, as it shows some people trying to “shake things up”. How can people be so stupid? The “Spoiled Brat Hegemony” is evil: they’re blaming Man for a naturally occurring phenomenon and they KNOW it. Who cares if CO2 causes warming? Where did the CO2 come from 250,000 years ago…350,000 years ago? Hint: it wasn’t MAN. And if trapping a STATIC heat source caused temperature to rise, you could power an oven with a CANDLE. These Enviro-statists are sick: they form the conclusion FIRST, then cherry pick the evidence that supports it. The Earth has a heartbeat, people: move along. My god, you are all so stupid. I am not going to explain the many, many, many reasons why you are wrong, as I know my time will be wasted, but please leave this stuff to the people with brains. We are entering an unprecedented phase of CO2 increase, and there WILL be major implications due to this. I am surprised you haven’t figured it out from the data. The process is due to a meteor striking earth. Dust is introduced in to the atmosphere initially and cause a drop in temperature with no change of CO2 concentration. Then as the dust settles in the planet’s waters and becomes the food for algae, large algae blooms reduce the CO2 like the well known Azolla event near 50 million years ago. As the CO2 ppm is reduced by the ocean’s algae blooms the temperature drops further. No charge! The charts show that when temperature and CO2 peak an Ice Age begins. Are you concerned that rising CO2 will bring on an Ice Age. I won’t live to see it. So, what is the cause of climate change? It may be a change in the behavior of our main source of heat and electromotive pulses, the Sun. It may be the result of changes in the axis or orbit of the earth relative to the Sun. Whatever is the cause, it has gone in cycles of about every 100,000 years, with no help from us humans. Whatever has been the cause of atmospheric warming, it ain’t CARBON DIOXIDE! That is scientific fact!